Tripshelf is an online marketplace for holiday packages - discover and compare thousands of packages conveniently! Tripshelf allows travelers to interact with verified tour operators, in order to get great deals for customised travel packages of the highest quality. Tripshelf is not an online tour operator, but gives you access to 100+ tour operators who specialize across destinations giving you the best price and quality. EVERYONE! Tripshelf aims to be the one stop shop for all kinds of holiday packages. Whether you are looking for a honeymoon package, a family getaway, or a quick weekend trip with your buddies, Tripshelf is your go-to website to get the best possible deals and make your travel bucket list come true! So is Tripshelf another Travel Agency? How is Tripshelf any different from other travel websites like Yatra, MakeMyTrip etc.? No, Tripshelf is not an online Travel Agency. 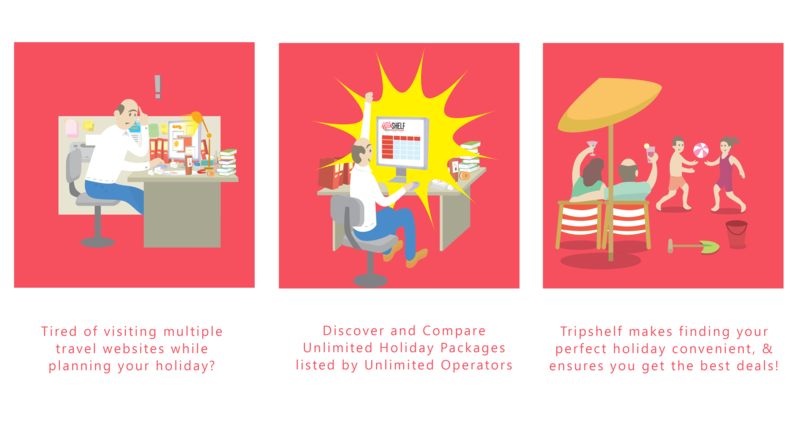 Tripshelf is an online mall where the best operators have displayed their holiday packages. As a traveller, you can browse through various destinations, compare different itineraries and request a customized quote for as many packages you like. You can receive multiple quotes and pick the one that suits your needs the best. You no longer have to go to 15 different websites of individual operators - we've brought it all under one roof (website)! Will I have to pay to use Tripshelf? Absolutely not! Tripshelf is free for all travellers and always will be. How do I use Tripshelf? Search - Type the destination you want to travel to in the search bar. Enter your month of travel and Voila - you will see a list of available itineraries. Filter & Shortlist - Filter packages based on your budget, your duration, type of holiday and more. This will help you narrow down your search to the perfect package. Compare - Shortlisted a few packages, but still can't decide. Add them to your comparison bucket and compare them side by side. Customize/Enquire - For customized quotes, simply enquire against the holiday package(s) of your choice and get the best quotes from specialized & verified operators. What if I dont know where I want to go? Browse through the different package categories on the home page, see the top International & domestic Packages, our have a look at our Staff Picks. What if I'm still confused? If Inspiration is what you're looking for - then click on 'Inspire Me'! How do I discover & compare packages? Discover - We aggregate and display a wide variety of packages from multiple tour operators, for multiple destinations and holiday types. Take your pick! Compare - By displaying all holiday packages in a standardised manner, Tripshelf makes the process of comparing travel packages convenient. Our intelligent comparison engine allows you to easily compare between preferred packages, to find what’s best for YOU! Holiday - One click to enquire, two clicks to book - the third to Holiday! I have enquired for a holiday package - now what? After sending an enquiry, you will receive a call from Tripshelf validating your enquiry and subsequently receive a phone call from the tour operator to discuss your package in greater detail, or customise the holiday package as per your tastes & preferences. Please click on the 'Log in' button on the top right hand corner to sign up. You can choose to sign up using your Facebook/Google accounts. Don't worry, Tripshelf will never post anything on your behalf. We promise! Click on 'Log In' on the top right corner. On the 'Log in' pop up, click on forgot password and enter your Tripshelf registered email id. You will then receive an automated email containing a link that will enable you to enter a new password for your account. What kind of holiday packages would I find on tripshelf? All kinds of holiday packages! How do I get more information on a particular package? Click on the holiday package to view details such as - price, hotels, day-wise itinerary, meals, transports, inclusions and exclusions. Still want more information? Just click on Enquire Now on the holiday package card and send your enquiry to the tour operator. We assure you the agency will reply within 2-4 business hours. Can I Customize a holiday package? Of course you can! Leave an Enquiry on the holiday package of your choice and the tour operator will help customise the holiday package for you. Tour Operators work directly with travellers to alter/customise existing packages according to their tastes and preferences. Tripshelf has curated a list of agents to ensure the highest standards of service. Tripshelf's travel specialists carry out their due diligence to ensure all agents listed on our website are verified in order to ensure the user gets the best possible experience. I don’t want to receive multiple calls. How many agents will contact me? You determine the number of agencies you want to initiate contact with. Tripshelf will never pass on your contact details to any agency unless you don't ask us to. Will the agent work with me offline? Yes, the tour operator will be working with you offline to customise the holiday package as per your request. Payments can be made directly to the tour operator or via tripshelf.com. All our tour operators accept online payments via NEFT/IMPS. For any other mode of payment, please contact your chosen travel agent. For #TripshelfQuickies, travellers can pay the seller via our secured payment gateway ( instamojo.com/@tripshelf ) - Net Banking/Debit Cards/Credit Cards accepted. You will have to get in touch with your agency to cancel your booking. Be sure to read the cancellation policy for the holiday package of your choice before you initiate the process of cancellation. Will I get a refund for my holiday package? Traveller satisfaction is of highest priority for us, hence, we hope this issue never surfaces. However, should you face such a situation, refer to the refund/cancellation policy shared by your chosen tour operator. Further, the refund process is governed by the clauses listed in the refund policy. It would be best to go through the Terms and Conditions as well as the Cancellation policies mentioned along with each package. Each tour operator has a different policy. Does Tripshelf offer any payment guarantees? While we verify all travel agents before they register on Tripshelf, if any tour operator fails to deliver, we do a thorough investigation and block the agency if their services are found to be deficient in anyway. Tripshelf endeavours to ensure all travellers' bookings performed or executed with reasonable skill and care. We will also negotiate and arbitrate on your behalf with the concerned tour operator and help you receive any amounts due in lieu of services not rendered. Tripshelf is able to do this since it provides tour operators a gateway to a lot of potential customers and tour operators must work in the favour of the customer. What if the holiday experience was not as good as it was supposed to be? We do feel that all the travel agencies listed on Tripshelf will do their best to ensure your holiday experience is awesome, however, we do understand that there can be certain unforeseen circumstances which have the potential to hamper the final experience. In these situations, we highly recommend you notify your travel agency as soon as you face an issue. At Tripshelf, we are committed to providing a hassle free experience to our travellers. If the issue can not be resolved between the agency and the user, the traveller should intimate Tripshelf, we will address your complaint on priority and investigate the matter. If the agency is found to be at fault, we will take necessary action against the agency and delist them from our website and assist the traveller in every way to ensure they get compensated by the errant agency. My holiday did not go as planned. What do I do now? The best solution is to post a review on the holiday package page. We take reviews very seriously and will do our due diligence to ensure the operator ensures better service next time around. If the operator consistently gets bad reviews for its packages then we will blacklist the operator and prevent them from listing their packages online. Further, if the lack of service on part of the agency was severely inexcusable, Tripshelf will blacklist the agency. Users can post a review on individual package pages, which in turn also acts a rating for the tour operator's service delivery. I have written a review but it doesn't show on the website. Why? That is because your review would contain spammy or inappropriate content that has been flagged by our moderators. In case, you feel that cannot be the case, contact Us. How can i be updated on the latest deals running on Tripshelf? Please subscribe to our mailing list and will ensure you know of every deal at the earliest. Alternatively, do keep checking our 'Deals' under 'See All Categories' to browse through the latest deals. I love Tripshelf, but I do not want to receive regular emails/updates. How do I ensure this? Every email has an 'Unsubscribe' button at the bottom. If you do not wish to receive any email updates, you could click on that and we will ensure your email id is taken off our promotional mailing list. Alternatively, please write us at info@tripshelf.com with the subject as UNSUBSCRIBE and we'll have your email removed. I am a Travel Agent, how can I sign up? You can sign up on the website via the sign up link or simply write to us at info@tripshelf.com. Our Agent on-boarding team will get back to you within 24 business hours! What are the features & benefits of signing up on Tripshelf? - Relevant targeting - You pick your audience, and we get you the inquiries! How can I get in touch with Tripshelf? Contact us at info@tripshelf.com and we will get back to you ASAP! Call us at 011-49058399 between 10 AM and 6 PM (Mon-Fri).